$51.99 & FREE Shipping on orders over $59. You now know JP as a host on the Brewing Network, but before the Brewing Network JP was an original employee at MoreBeer! where his first job was cleaning up an infamous and massive malt extract spill Olin caused while taking and filling orders at the same time. Because JP tends to get really good boilovers when he brews he usually makes high gravity beers whether he intends to or not. It may have something to do with consumption while brewing, not that any of us know anything about that. The result is always a starting gravity that is higher than anticipated. We put the beer on tap in the shop and it got rave reviews. It was both outstanding and unique. Sometimes things do happen for a reason! The beer can easily be described as a Porter on steroids. This kit has a lot of grain in it, so you may find two grain bags useful. This is a good beer and I've brewed this 3 times before. 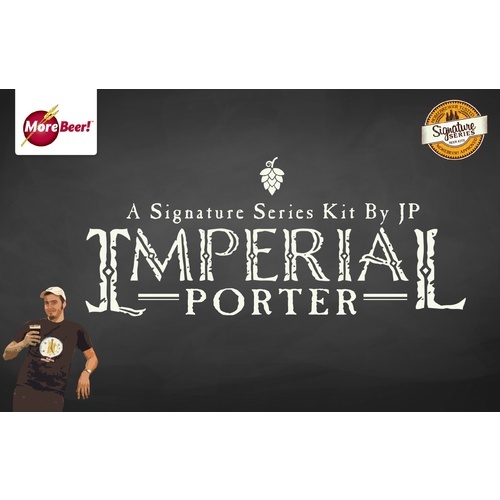 I recently purchased this kit and am new to brewing. The recipe does not mention the proper time to add the Maltodextrin. Is it with the LME at the beginning of the boil or at some other point? BEST ANSWER: Yes, add the DME at the same time as the Ultralight and then get ready to stir like crazy to avoid a boil over. 2 weeks in the fermenter @ 66 deg, 2 weeks in the bottle, and a real crowd pleaser. I used A09 Pub yeast, turned out around 8.2% & 76% attenuated. Goes down easy, slightly sweet with low bitter, nice carbonation and head. The friends l give it to that like "dark beers" tell me it's great, and those that don't usually go for darks raise their eyebrows and smile with a slight head-turn. From my sister: "Best Beer I ever had"
Good Lord! I made this one Approx 8 months prior to serving. Bottled not kegged, and ended with an ABV that the yeast could not survive in. Added Champagne yeast to try and help but ended with very low carbonation, however the taste and mouthfeel more than made up for that flaw. Next time I will keg and force carb with Nitro. I agree that this is a great beer and the best I ever made. Very complex beer with a high ABV. Nice roasty flavor and great for the cold winter months. 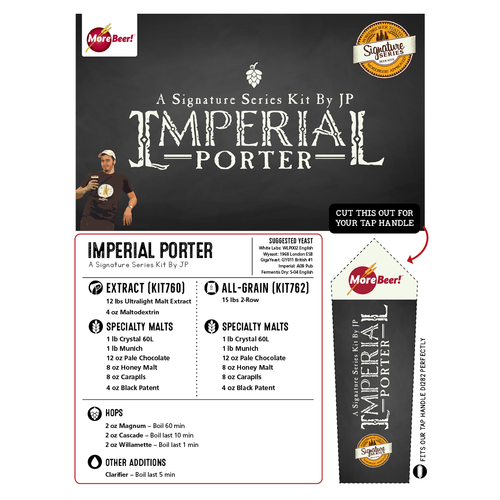 I have lost track of the number of times that I have brewed this Imperial Porter. 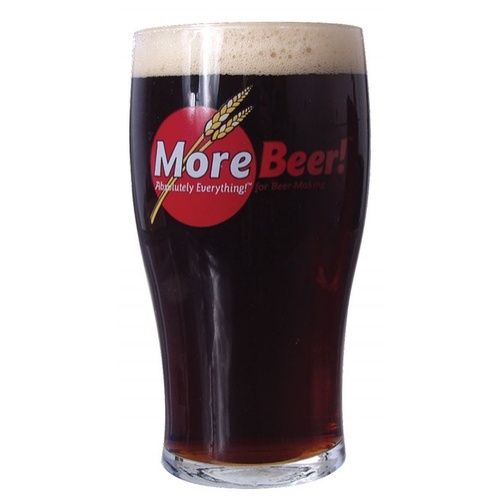 It is one of the finest beers that I have ever brewed! I add 4 oz. of espresso just prior to bottling to give it just a little bit more complexity. Condition it and it becomes like a fine wine! I brewed this one a couple weeks ago. I'm going to let it sit int he keg for a good 6 months. What I did taste out of the secondary was great! Ad the gravity was right on.